The Guantanamo Bay hunger strike has entered its 47th day, with no end in sight. According to the prison’s Director of Public Affairs, 26 inmates are refusing food, with eight detainees receiving enteral sustenance. The situation has alarmed Lt. Col Barry Wingard, a US military attorney who advocates for Guantanamo detainees. Wingard spoke to RT about the future of Guantanamo Bay’s 166 detainees. RT: I understand you have access to your clients in Guantanamo – when was the last time you saw them and what state were they in? Lt. Col Barry Wingard: The last time I saw my clients was between the February 25 and March 8. I visited with them multiple times. I was shocked at the condition they were in. In fact, we were the first people who broke the story that the hunger strike had begun around February 6 or 7 and had continued on. My client at that point had lost 26 pounds (12kg) and at this point it’s official that he’s lost almost 40 pounds (18kg) – one third of his body weight from 147 pounds (67kg). RT:How long can they go on like that? BW: I can imagine we’re getting near to the end when something serious is going to happen. 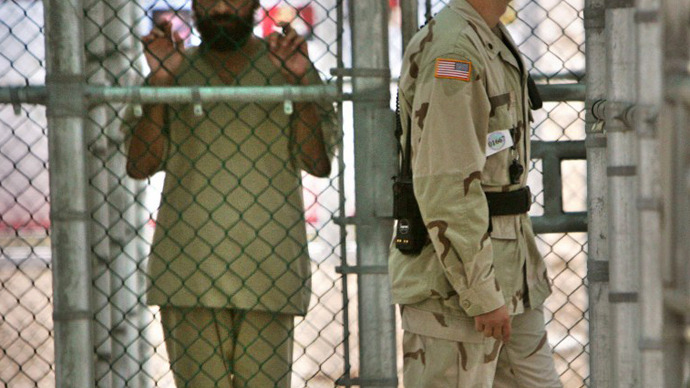 The administration down in Guantanamo Bay initially denied the report that the hunger strike was occurring. They then said it was seven, then 14, then 21 people. They then said it wasn’t the largest hunger strike in history. Then they came out and said it’s 24, 25, and today 26 people. So the story is getting more accurate as we go, but we’re running out of time. RT:Do you think it really will take that? BW: Well I’m here to tell you that after 11-and-a-half years, these men that live in animal cages in America’s offshore prison in Guantanamo Bay, they ask for justice. They’ve been there 11-and-a-half years. Ninety per cent of them have no charges [against them]. I can tell you having looked at my clients’ cases, they will never get a trial based upon the evidence that is against them, so if their home countries are not willing to intervene and do something, I don’t see it coming from Washington. Washington seems to take the position that we don’t have time to deal with these 166 condemned men in our offshore prison. RT:How’s Washington going to deal with the PR if someone does die? BW: Well you’re going to have to answer that as a political question. I’m a lawyer. I’m here to look at the facts and tell you that I’ve reviewed these cases and these guys will never get trials. If they’re never getting trials, then we have to go by what the president said in March 2011, when he said indefinite detention will be implemented in Guantanamo Bay and will be the law of the United States. Forty-eight men will be condemned to die never being given a trial or given an opportunity to defend themselves. They are essentially dead men who just happen to breathe. RT:For the people you’ve spoken to there – including your clients – what was their mindset? Is it the same as when they started 45/46 days ago, as it is now? Did they think they’d have to take this through to the bitter end, or did they think something would give beforehand? BW: I can’t speak for what every man down there thought, but what I can tell you is that the vast majority of people in Guantanamo Bay are cleared for release. They’re cleared to go home. The United States acknowledges that they’ve committed no crime, yet we still continue to house them in a penal colony in Guantanamo Bay. Imagine if the situation was reversed and the US had 166 citizens held in some other country’s offshore prison. I don’t want to go into what happened in the early years as far as enhanced interrogation, but the situation isn’t getting any better. These men have figured out that probably the only way for them to go home – cleared or not – is in a wooden box. RT:Do you take any comfort at all in this US military plan to spend $49 million on the facility, supposedly making it more comfortable for the inmates? BW: This is not about soccer fields or food or anything else. This is about justice and freedom. This is a bigger concept. This is what the US stands for. Not more servings of food or more soccer fields to play on. This is a matter of getting these men home or giving them trials.